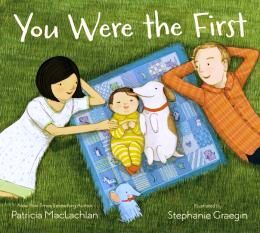 One of the sweetest books you ever want to read is author Patricia MacLachlan’s latest picture book, You Were the First. You Were the First is the story of a doting young couple that celebrates all the wonderful “firsts” of their firstborn child. There are simple firsts, like being “the first to sleep in the basket with the yellow ribbon wound round.” Then there is the first to cry, the first to smile, and the first to blow a kiss at the family dog. There’s the first to enjoy a belly-laugh, the first to sleep on Mama’s shoulder, the first to crawl down the hallway toward Daddy in his stocking feet, and the first to make a snow-angel. You Were the First is just adorable. 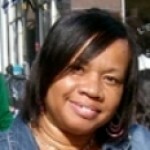 It chronicles all the blessed firsts that make parents smile, cry and swell with love. Readers get to experience the milestones right along with the book’s characters, but they also get another surprise: They get to see the baby in the book grow up right before their very eyes. From swaddling to crawling to chasing falling leaves, parents and their little ones get to laugh out loud and cheer for the growing baby boy in the book. They also get to enjoy his pride when he experiences another beautiful “first” and becomes a big brother for the very first time. This book is perfect for lap time or “a-story-before-bedtime” time. It provides the perfect opportunity to bond when the grown-up reads it to child, but it can also be a “discovery” book when the emerging reader flips the pages for himself/herself and watches the little MC go from baby to toddler. The colors are warm and family-friendly, the scenes are cozy and familiar, and the sentences are sweet and soothing to any child’s soul.